PRODUCT: Rocky Mountain saddlebags are the largest, most versatile saddle bags in the Wolfman lineup. The internal stiffeners along the inside of the bag make them almost rigid for mounting on side racks. Flexible side panels and several compression straps make it easy to secure loads, large or small. The top opening is slightly wider than the bottom to make loading easier. The included waterproof liners with roll and buckle closing systems make loading and unloading easy. The saddlebags are constructed using a custom, vinyl-coated, 1680-denier, ballistic-nylon fabric. The liners are made from a polyurethane-coated nylon with sealed seams. 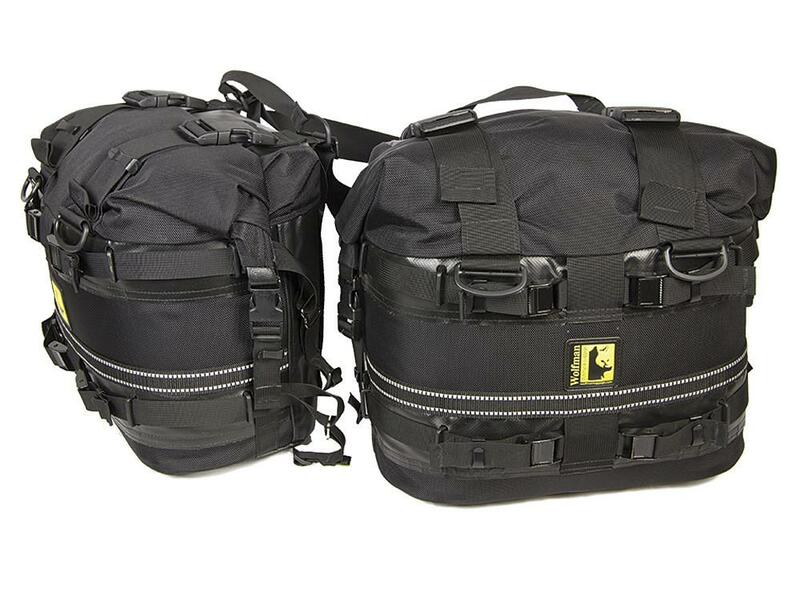 Each bag holds 33 liters of gear. There are handles built into the tops of the bags to make it easy to carry them when off the bike. Two-inch D-rings on the top and front of each bag allow easy attachment of accessory items. The bags have been designed to attach to a variety of oval-/rectangle-shaped racks with a max height of 9.5 inches. OUR TAKE: We’ve been using our Rocky Mountain saddlebags for a little over two years on a couple different motorcycles. Over the years we’ve used both hard luggage and a couple different sets of soft bags. The hard bags are secure (lockable) and very waterproof. The other brands of soft luggage just didn’t hold up for more than a few rides before the seams started to separate or straps broke. Other than being dirty from a few thousand miles of off-road use, the Wolfman bags aren’t showing any signs of giving up. We love the ability to compress the load and keep it close to the center of the bike. The liners make it super easy to get to your gear when stopping for the night. The yellow color is more than advertising hype. Digging inside the bag when it’s pitch dark using a flashlight is a whole lot easier with the bright color. When doing one of those “Oh, crud!” dabs that cause your boot to flail back into the saddle bag, it’s a whole lot nicer hitting a soft bag versus a big metal box. With the addition of our large Wolfman Expedition Dry duffle, seven-day trips have been a breeze. The two over-the-seat straps and pannier straps have proven to be extremely secure and easy to use. Mounting and removal take about two minutes. We usually carry a small cargo net, and the D-rings are perfect for attaching the hooks. GROANS: The only real issue we’ve encountered is convenience. Hard saddle bags almost always include a locking system and usually come off their mounts with one latch. If you stop at a restaurant for lunch, you’ll want to find a seat that allows you to keep an eye on your gear. BOTTOM LINE: Over the years we’ve spent a lot of time doing multi-day adventure rides. We’ve used everything from OE hard bags to budget soft bags and always head for our Rocky Mountain saddlebags first. They are more expensive than other options but worth the upfront cost. Ours are looking used without showing any signs of wearing out.